You might know this about me by now, but I am obsessed with Rick Rack. I have taken my obsession to a new level with this dress. 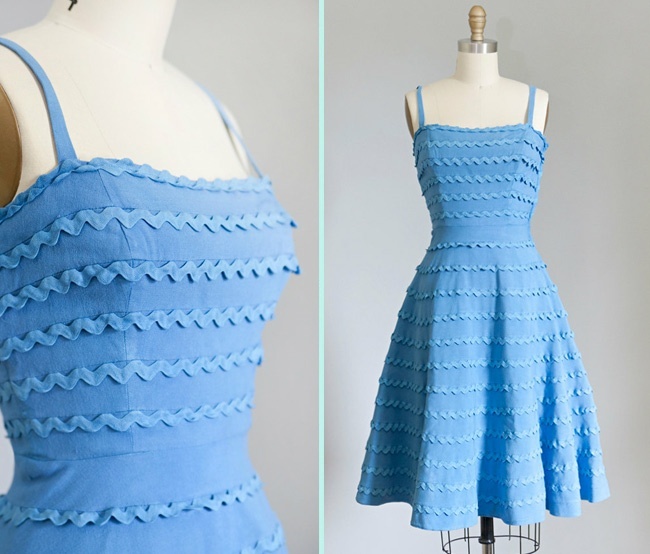 I first saw this vintage dress on the Coletterie blog, on a detail inspiration post: Rick Rack. I've been dreaming of it for over a year now, and deciding how to make it. We got a new shipment of this perfect shade of blue rick rack at work, I snatched up the entire spool, all 28 yards of it. We also happened to have the perfect shade of blue dress cotton, with a bit of stretch to it, and I took home 3.5 yards of that. That was a few months ago and been debating which way to sew this dress. Last week I had off from work, and we decided to have our first anniversary party on Sunday, so what better time to make this dress. I started on Tuesday, had a freak out about the rick rack placement, went to work and my boss who is a couture goddess, helped me out of my freakout. For the top I used the bodice from Colette Patterns Lily, I made this dress not long ago and the bodice was already fitted. The band at the top was omitted, and I added a semi circle skirt. To sew on the rick rack I marked the pattern, and then the bodice every 2 inches, and then sewed the bodice and skirt, and attached the rick rack across, leaving the left side open. I wasn't sure if I would have enough Rick Rack, and ran out with about with 8 yard still to go. We did not have anymore in stock at Fabricland, because I bought it all, so a trip to NYC to seek out the rest was in order. Thank God, I found some at my first stop, M&J trimmings. It was the same brand, color and size but the zig zags aren't as tall. The top two rows of the skirt are this new rick rack, but it is unnoticeable while wearing it. As you can see, I had to curve the rick rack in the front bodice to accommodate the girls, and my more dramatic princess seam than the tiny original. We took some pictures on our anniversary, at the same place as our wedding day, at Acorn Hall in Morristown NJ. It's a gorgeous old mansion, that was right next to our reception. I'm also wearing my wedding shoes, which I am still obsessed with. This is so so so cute! I might have to break out my rick rack soon! That is so pretty! It really looks like a vintage treasure! Perfect nails too! Fun! Most applications of rick rack can be so tacky, but yours is all class! Your version is a wonderful interpretation! It looks fantastic on you too! Ooh, I was sent a link to this dress as I'm a tad in love with rick rack myself. It's beautiful!! Looks amazing with all that glorious detailing. Nice work!! cute! you look awesome! great copycat job! Gorgeous interpretation! And happy anniversary, wow, a year already! What a beautiful recreation! I really like how your rick rack curves under the bust. Lovely job!